Carrots are orange in color, sweet to taste, and also crunchy. It is included in most of the vegetarian dishes. It is also eaten raw in salads. The juice of carrots is tasty and has a lot of health benefits. Collagen, which is essential for maintaining the elasticity of the skin, needs Vitamin C for its production. Carrot is rich in Vitamin C and aids in collagen production. This prevents the formation of wrinkles and keeps your skin looking young. Vitamin A, with its antioxidant properties, prevents wrinkle formation, pigmentation and uneven skin tone. Carrot is a rich source of Vitamin C and antioxidants. So consumption of carrots regularly helps in keeping your skin healthy and glowing. You get a glowing skin by applying a face mask made by grinding carrot, to which honey is added. Blemishes and scars are greatly reduced by drinking carrot juice regularly. Applying the pulp of carrot on the skin is also an effective way. The high potassium content in carrots keep the skin from drying. So having carrot juice keeps your skin hydrated. The antioxidants present in carrots helps in treating pimples, acne, dermatitis, rashes and other skin problems. It also has healing properties and cure wounds and cuts easily. Having carrot juice prevents the harmful actions of the sun on your skin. This is because of beta carotene present in carrots, which gets converted to Vitamin a in the body. This h repairs the tissues of the skin and protects the skin from the harmful rays of the sun. Drinking carrot juice provides important vitamins to your hair and makes them strong and tick, as well as shiny. By having 3 to 4 ounces of carrot juice daily increases the growth of the hair and also provides you a thicker hair. It also improves the blood circulation on your scalp because of the presence of Vitamins C and E in them. This prevents premature graying of the hair. Carrots also act as an anti-ageing agent because of the presence of beta carotene in large amounts. It plays the role of an antioxidant and prevents and reverses the cell damage done by regular metabolism, thus slowing down the signs of ageing. Carrots greatly reduce the risk of foetal infections and miscarriage and assists in the proper development of the foetus. It is also said that if expectant mothers take carrots regularly, it will increase the production and quality of breast milk. Women are greatly benefited by taking carrot juice regularly. The phytoestrogen present in carrots helps in regularizing bleeding in women with heavy menstrual flow and also reduces the pain during these times. It prevents hot flashes and stabilizes the menopausal systems in post-menopausal women. The nutrients, antioxidants and vitamins present in carrots greatly improve your immune system. So take carrots regularly and stay immune to various types of diseases. The antioxidants and polyacetylenes present in carrots protect the heart from various diseases. Carrots also contain alpha-carotene and lutein in addition to beta carotene. Regular intake of carrots protects the heart from oxidative damage, bad cholesterol elevation and plaque formation, because of the soluble fibers in them that combine with bile acids. Carrots being rich in Vitamin A, helps the liver in flushing out harmful toxins from the body. It also lowers the accumulation of bile and fat in the body. The soluble fibers present in carrots helps in cleansing the colon by enhancing the removal of wastes materials. 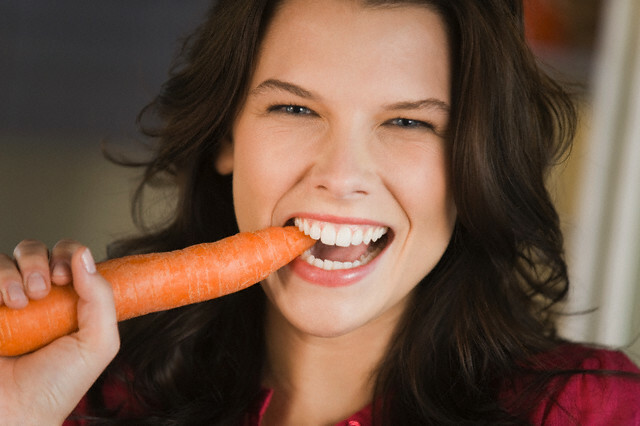 Carrots are beneficial for your teeth and gums in many ways. It acts as a tooth brush and tooth paste and removes plaque and food particles from your teeth and mouth. They also enhance the formation of saliva by stimulating the gums. Saliva, being alkaline in nature, balances the bacteria which are acid-forming and cavity-forming. Moreover, carrots contain minerals that kill the harmful germs in the mouth and helps in the prevention of tooth decay. The fibers present in carrots helps in digestion and the regular movement of the bowel, thus preventing constipation and acid reflux. The fiber also helps in losing weight and checks the level of sugar in the blood. Consuming carrots regularly is the best way to have healthy eyes. This is because carrots contain beta carotene, which gets converted to Vitamin A in the liver. Vitamin A thus formed is converted into rhodopsin in the retina, which is a purple pigment that is needed for night vision. Moreover, beta carotene is also useful in preventing glaucoma, macular degeneration and senile cataracts. The carotenoids present in carats regulate the blood sugar and the alkaline elements in them help in purifying and revitalizing the blood. It also maintains the acid alkaline ratio in the body. The potassium present in carrots helps in controlling blood pressure by balancing the sodium level in the body. Carrots have anti carcinogenic properties because of the presence of the poly-acetylene, falcarinol, which destroys pre-cancerous cells in the tumors and fight against cancer. Regular consumption of carrots greatly reduces the risk of lung, breast and colon cancers. A research carried out by Harvard University states that people who consume more than six carrots per week have lesser chance to suffer from strokes than those who have one carrot a month or even less. Carrots also contain calcium, which is necessary for the development of healthy bones in children and women. In short, having carrots regularly has many health and beauty benefits and you must include it in your regular diet. Eating the right foods help us to enhance our skin.Carrot are rich in nutrients and minerals which are good for skin and for overall health.Thanks for highlighting some of its benefits!